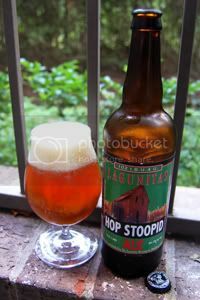 Lagunitas is a company known for hoppy beers, so when their hoppiest beer showed up here in Houston, I was thrilled. As good as their IPAs and Double IPAs had been to me, I couldn't wait to try their biggest hoppy beer was. Apparently, the idea behind Hop Stoopid was to cram as many different types of hops into the bottle as possible. Unfortunately though, they don't list the hop bill so we'll have to take their word for it. They also don't provide any details on the malt bill, so we'll just have to guess there, too. "Give it to Mikey, he'll drink anything!" Up the bomber went in toast, then to his lips, and what happened next could not have been foreseen. Hop Stoopid, a slick re-animator green fluid oozed from the bottle. When it crossed his teeth and came in contact with the bitterness flavor receptors on his tongue, his eyes rolled back in his head, he did sort of a death rattle, a cloud crossed the Sun, an all his hair fell out. A spot on the side of his cheek blistered and a little bit of juice squirted out laterally starting a small fire. The rest of his head did the Indiana Jones melting Nazi thing, and as his head drained down his shirt and into the open stump of his esophagus, a little whistling noise came from the navel, which burst open and onto his pals, one in the forehead and the other in the eye. Finally, the carcass slumped forward in a gelatinous mess, caught fire, and burned for three weeks. Here's hoping there was some level of hyperbole in there, because I have things to do later today. Appearance: A crystal-clear, orange-amber body that's lighter than most Double IPAs. Up top there's two fingers of creamy, off-white head that features great retention and lacing. Aroma: Moderately pungent and citrusy hops over sweet, biscuity malt. Taste: Up front, a hop profile of pine, pineapple, grapefruit that is mildly bitter given the style. The malt backbone, as one might predict given the hue, is notably paler than the average Double IPA. The aftertaste is mildly bitter and biscuity but trails off a little quickly. Drinkability: Above average for the Double IPA style. Verdict: Hop Stoopid is a tasty beer, but perhaps a little plain compared to other Double IPAs. Maybe it's the way the beer is hopped, maybe it's the paler than normal malt base, or maybe it's the combination of both factors, but at the end of the day this comes off as an easier drinking and slightly less bitter take on the Double IPA. Also, props for the price point.